Registration Deadline: All teams must submit a 2-page abstract by February 11th 2018. For more details, please read the Call for Contesters. The slide deck that was used during the official results announcement session can be found HERE. The detailed ground truth measurements and error visualization for each team, as well as the 3D point cloud of the evaluation area can be found HERE. Each team is assigned a short acronym comprised of 2-4 letters. There is an excel file for each category (2D and 3D) that maps the full submissions to these acronyms. Important note: these results have been further refined since the official announcement of the results to better synchronize the system under test and the ground truth system. As a result, some teams might see slight differences in the reported accuracies in this data when compared to the graphs below. These differences have no impact on the ranking of the top teams. Ranking only changed for a few teams towards the tail. Note 1: Organizers considered Naviguy and Ariel University to have the same accuracy as the difference of 10cm is well within the error of this type of technologies. 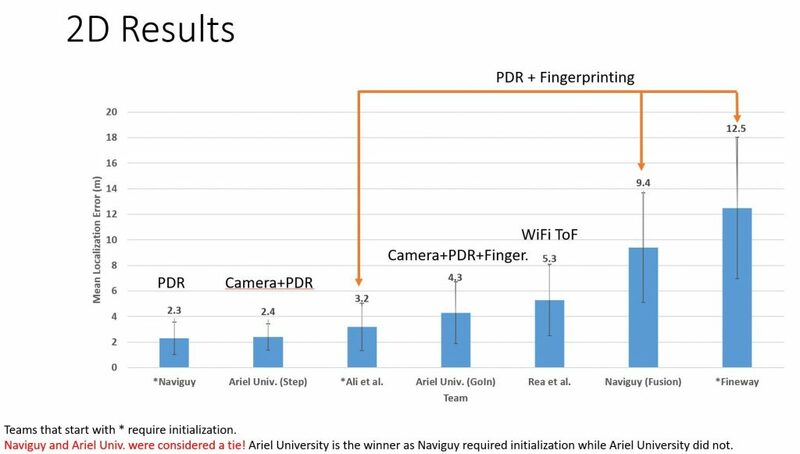 Given that Naviguy had to be explicitly initialized to a known location at the beginning of the evaluation, Ariel University takes the first place, and Naviguy the second place. Note 2: Given that we had only 7 submissions in the 2D category, only the top 2 teams are eligible for awards. Note 3: Rea et al. had 2 of their 10 APs fail during the evaluation. In addition, they used the wrong system configuration during evaluation. After fixing some of the issues, and re-processing the data after the competition, the team reported an improved accuracy of 3.39m. Notes: Organizers considered SND Smart Ltd and Yodel Labs to have the same accuracy. Both academia and industry submissions are encouraged. All location techniques, such as ranging, fingerprinting, infrastructure, or device free, are welcome, except those that require end users’ manual measurements. Contesters can deploy their own infrastructure of up to 10 devices (this number is tentative and it will be finalized after the submission deadline). Normal RF interference is expected, but no jammers from other deployments are allowed. The results must be shown on a portable device, such as a phone or a tablet/laptop that a person can easily carry around. 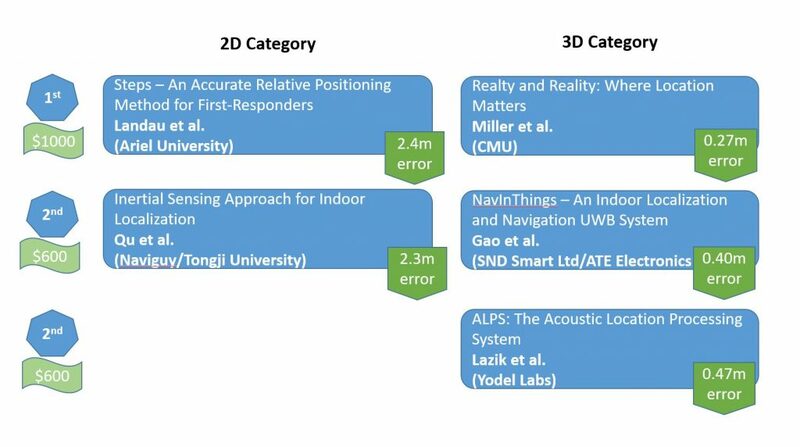 In this year’s competition, teams will be required to report 3D locations (X,Y,Z). The evaluation area we have reserved, even though it does not contain multiple floors, it includes locations with different elevation characteristics. 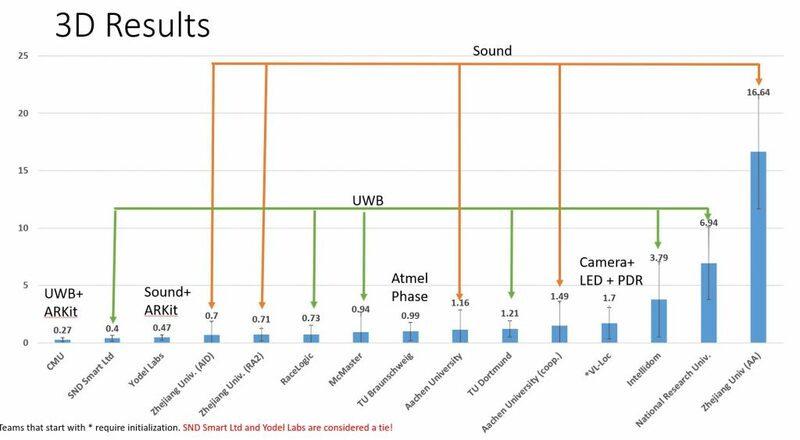 On top of that, we plan to place the devices to be localized at different heights during the competition to evaluate the 3D localization accuracy of each team. LiDAR-based systems will not be accepted to the competition this year. LiDAR is reserved for ground truth measurements. Also, the use of laser range finders is allowed only during the setup of each system and not during its evaluation. Other than the LiDAR and laser range finder restrictions outlined above, there are no other technology restrictions. Traditionally, teams were evaluated on their accuracy in estimating locations of individual points. This year, teams will be evaluated on their tracking accuracy as opposed to point accuracy. Each system under test will be taken through a pre-determined path and will output its estimated location at a predetermined rate while walking along the path. The system that will be able to approximate the ground truth path with the highest overall accuracy wins. Organizers will provide more details about the evaluation process and its logistics as we get closer to the competition. Contesters must submit an abstract describing their approach and deployment requirements by the contest registration deadline. Submissions are treated as confidential until the competition. Submissions must be at most two (2) single-spaced 8.5″ x 11″ pages, including figures, tables, and references. Submission should follow the exact same format as regular, full IPSN 2018 papers. 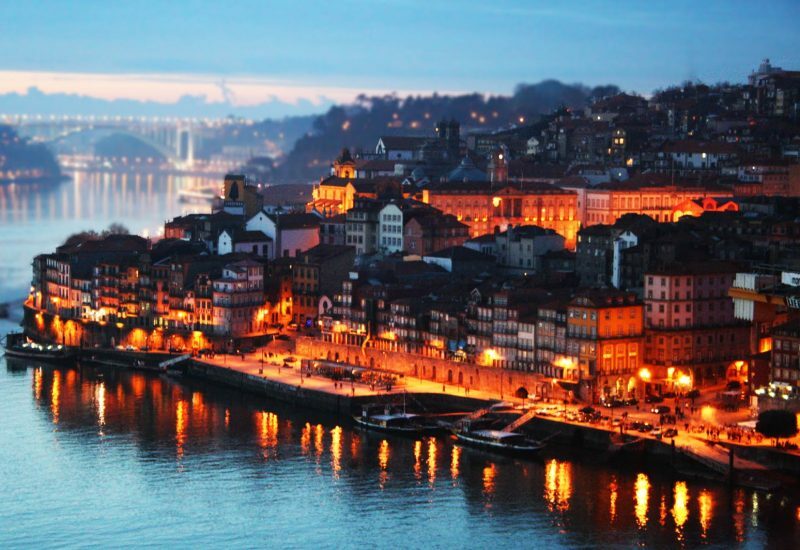 Abstracts should include the names and affiliations of all authors. Templates can be found here. Abstracts should be sent over email to: dlymper@microsoft.com on or before February 11th 2018 with the following subject line: 2018 Microsoft Indoor Localization Competition Submission. Please read this information carefully! This year, each team is required to provide an output text file with the recorded locations at the end of the evaluation. More details are in the document linked above. April 10th 8:30 – 17:00 Setup Day. All teams meet at the evaluation area at 8:30am to go over the rules. 34 indoor location systems from 31 teams have registered to participate to the competition. Given the type and number of submissions we received, we had to classify all teams in two categories similarly to the previous years: Infrastructure-Free (12 submissions) and Infrastructure-Based (22 submissions) systems. A list of all the teams in each of the categories is provided below. All teams that have been assigned an evaluation time slot have at least one member officially registered. Teams that have not been assigned an evaluation time slot will not be allowed to compete during the competition. The data in the table below reflects registrations as of March 20th 2018.